This week pizza is on the menu for the Food Matters Project. This recipe left a lot open for interpretation and I wanted to push the envelope a little. We love to make pizza a few times a month and I must admit that we get in a little bit of a rut always topping them with the same ingredients. Since the project focuses on eating less meat and animal products I wanted to stick to something vegetarian. 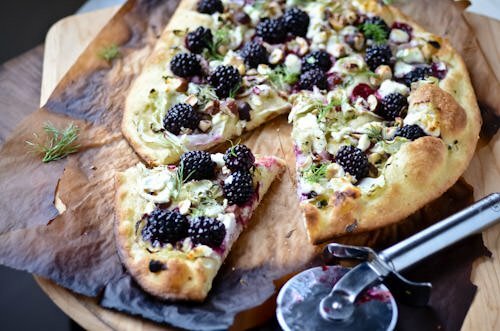 I have been hoarding the most amazing blackberries in the freezer that from last fall, why not use them to make a savory pizza? I figured this was the perfect opportunity to experiment. I started thinking about flavors that would go well together and decided to try a fruit based pie. 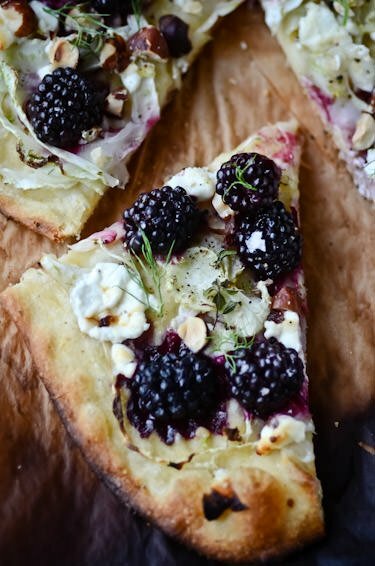 I paired the blackberries with sliced fennel, tangy goat cheese and toasted hazelnuts and finished the whole thing off with a drizzle of honey. 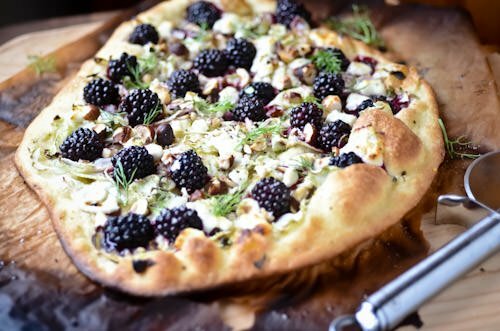 I also added some cornmeal to the crust for a little bit more crunch since I thought it would pair nicely with the blackberries. I loved this pizza, I couldn’t stop eating it, the flavors were fresh and bright and it wasn’t too heavy. I am excited to see what everyone else topped their pizzas with! For the original recipe and all the other versions visit The Food Matters Project. Combine the flour, cornmeal, yeast, and salt in a large bowl. Stir in 1 1/2 cups water. The dough should be relatively sticky and wet. Scrape down the sides of the bowl, cover, and put it in a warm spot. Let the dough sit for at least 6 or up to 12 hours. When you’re ready to bake the pizza, heat the oven to 500 degrees. Divide the dough into half or quarters depending on the size you want your finished pizza to be. Working with one portion at a time, gather the four corners together and mold gently into a ball. Dust the balls lightly with flour and let rest for 1 hour. Shape the dough into a round shape trying to get it as thin as possible without tearing it. 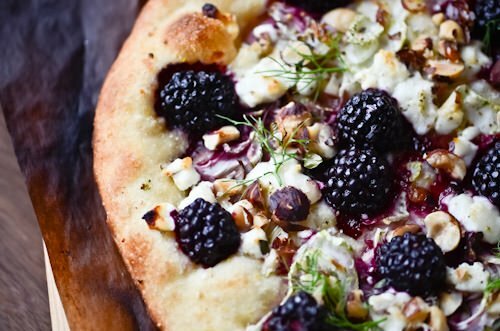 Lightly drizzle the dough with a teaspoon of olive oil and top with the blackberries, fennel and goat cheese. 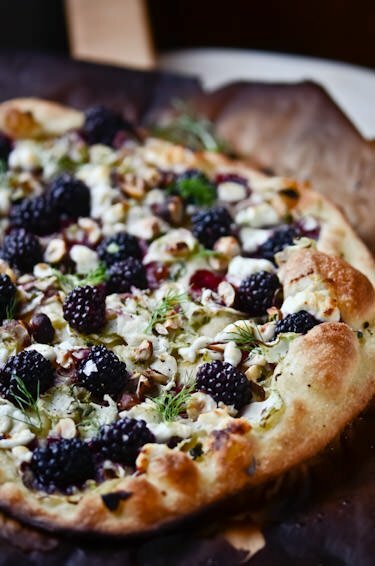 Sprinkle the thyme and hazelnuts over the top and bake until the crust is crispy and the cheese is melted 8 to 12 minutes. Sprinkle with the reserved fennel fronds and drizzle with honey. Let stand for a few minutes before slicing and serve while still hot. Made this tonight and it was fantastic! Used pecans instead of hazelnuts, as they weren’t in season. It was so good! Big hit!! I’m starting to work on actually caring about the food I put into myself and keeping my body healthy, this was a good in-between (with the goat cheese and all!). Do you have any nutrition facts on this so I can log it for my diet site?? Made it tonight–good, but I thought this was a little much on the sweet side, even without honey. I added capers which hit the spot. Next time I may try topping off with sea salt, or a drizzle of balsamic could work nicely. Thanks! I’m so glad you liked it! We love to experiment with new pizza combinations and I’ve been known to use store bought dough on a busy weeknight as well! Thanks for trying the recipe! Thanks for sharing! I can’t wait to make it. I will be purchasing Wegman’s fresh dough!